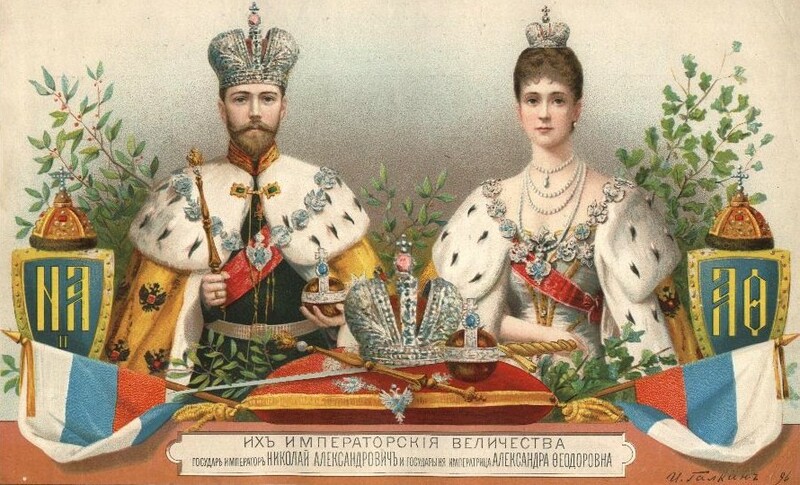 On May 26, 1896, Nicholas and Alexandra were crowned Tsar and Tsarina of Russia in the Uspenski Cathedral in Moscow. 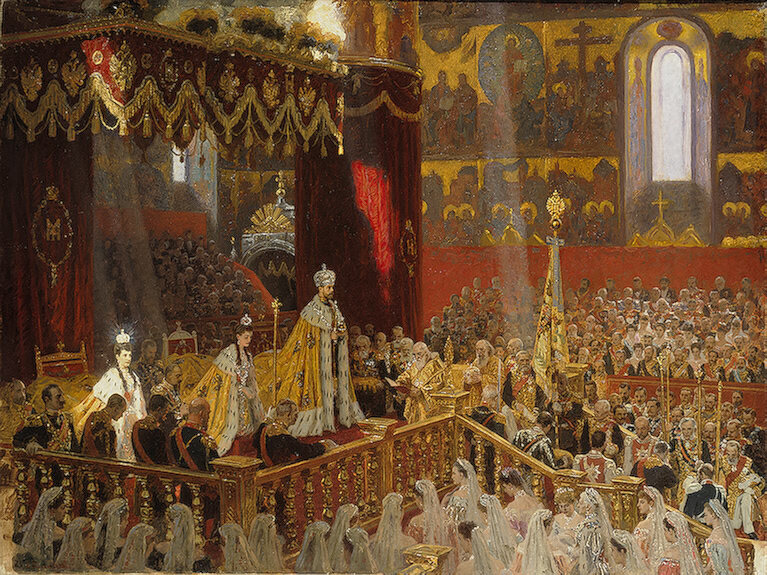 It was one of the most magnificent pageants in Russian history. Over 7,000 guests from across the globe, including most of Europe’s royalty, attended. The celebrations lasted for two weeks. 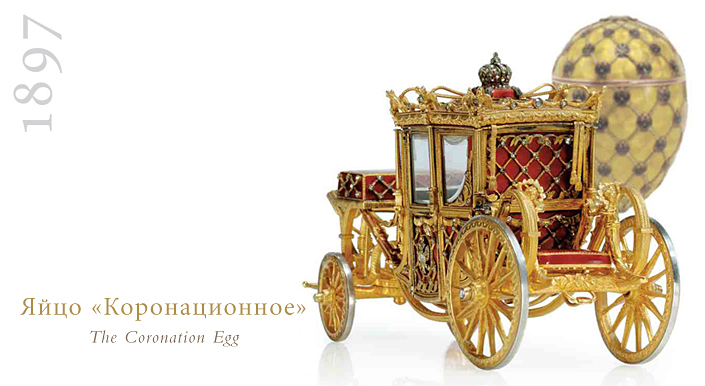 At Easter 1897, Tsar Nicholas II presented his wife with a fabulous Easter egg to commemorate the coronation. Nicholas was in the habit of giving his wife an Imperial Easter egg every year. 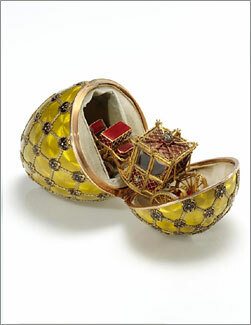 But the Coronation Egg (1897) was larger and more lavish than any before. The surface was enameled primrose yellow in a field of starbursts. Trellised with bands of laurel made of gold, each intersection was marked by Imperial eagles bearing tiny diamonds on their chests. Readers, for more on Nicholas and Alexandra on this blog, click here. 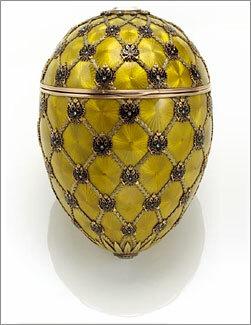 To see more Faberge Imperial Egg history, click here. Thanks Lisa, I love Russian history since I am half Russian and love to read about this country. !Ann, I’m glad you liked the post. I will be writing many on the Romanovs in the near future. Tell your friends. Thank you for presenting this information to the public. I was startled several years ago upon visiting the Armory in the Kremlin where the most exclusive collection of gifts presented to Alexandra were maintained along with gowns, jewels, and Catherine’s golden carriage. What was odd, and most appalling, was that the material of the gowns and some of the other displays were unprotected from the destructive elements of air, potential human touch, and deterioration due to time alone. We were informed that the Smithsonian Museum in Washington, D.C. has offered its extensive expertise to assist in the preservation of these invaluable pieces if only for the sake of demonstrating to those in the future what the past held in Moscow. However, the offers have been refused. Are you familiar with this very potentially distressing outcome for those who value historical artifacts? As an American who values the preserved representative items from significant eras in our past, I can only imagine that Russians, as well as those who study the history of their people today and in the future would be interested in their history. Why would they not question the basis of decisions not to preserve these relics, particularly since they represent the opulence that was once causing such suffering to those who preceded them and not a loss of what their leaders profess to be a detested class in their history? Is it purely a political issue, or are other factors involved? Thanks so much for your commentaries.